On this page, you'll find a step by step walk-through on how to join the #1 most popular paid Japanese adult site "Caribbeancom.com". All it takes is 2 to 3 mins! ① Open the "入会案内" page. Click on the "入会案内" button at the top right of the site. Caribbeancom.com offers 30 days, 90 days(VIP status), and 180 days(SuperVIP status) membership plans. Find what suites you best and click on the "お申し込み" button. Once you open the sign up form, continue filling in the boxes. The entire transaction is securely powered by D2Pass - a third party Common Authentication System & Service provider. ① Create your D2Pass ID & password. You will be using these credentials to log into Caribbeancom.com. Free Email services such as Gmail and Yahoo are accepted. 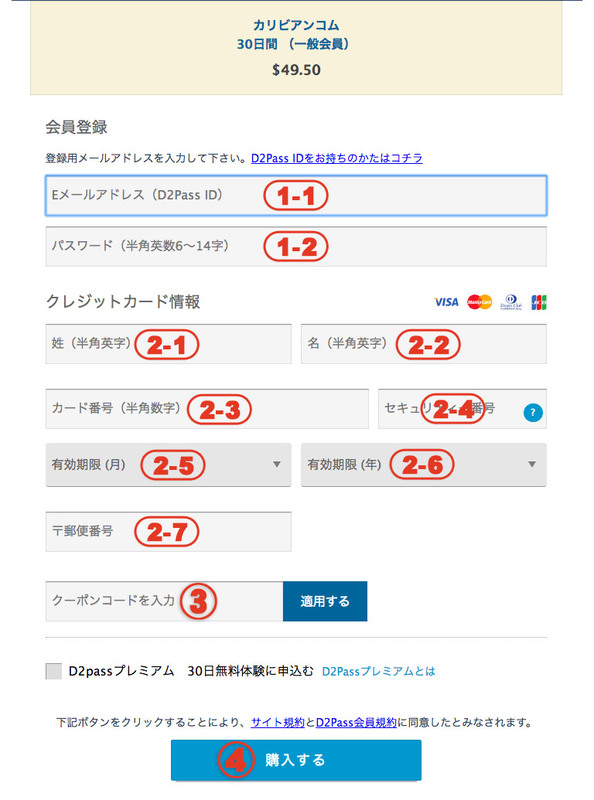 ② Enter your payment info. Type in your discount code here if you have one. ④ Review your information and Submit! Make sure the form is properly filled out, read the Terms of Service and click on the "購入する" button to complete your sign up. Once the sign up is complete, you'll be taken to a page where you can proceed to the member area of Caribbeancom.com. How to View Movies on Caribbeancom! Not a member of Caribbeancom.com yet? ① First and foremost, you'll need to log in. 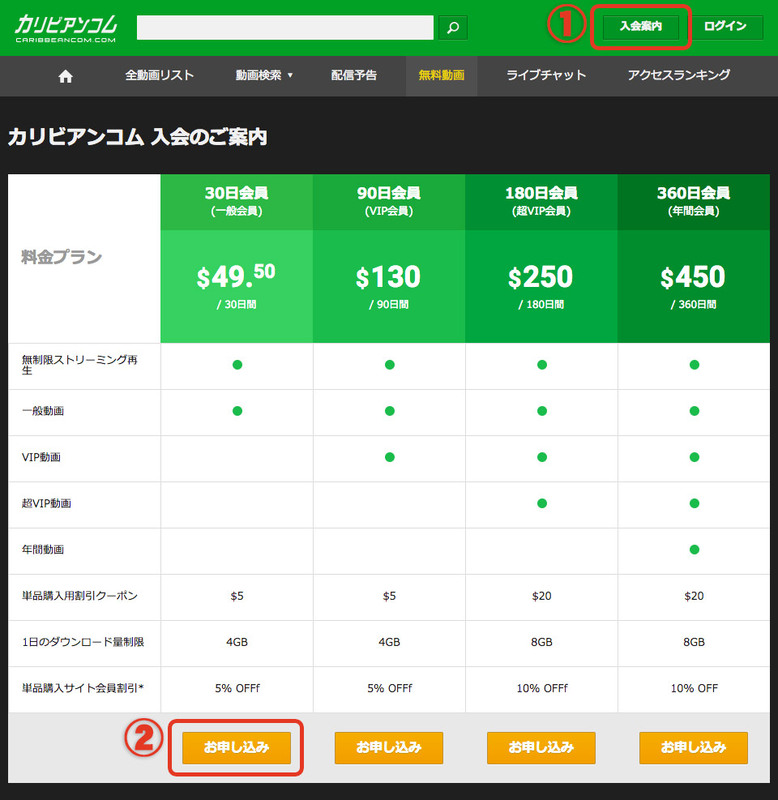 Click on the "ログイン" button at the top right of the site. ② Enter in your credentials and proceed to the member area. Selecting "次回からIDの入力を省略" or "次回からIDとパスワードを省略" will make it easier to log in next time. Click on the "ログイン" button to access the member's area. ③ Once you're logged in, the red highlighted section should show your D2Pass ID, indicating your membership status/detail. ⑤ Find the movie you'd like to enjoy and click on the thumbnail. 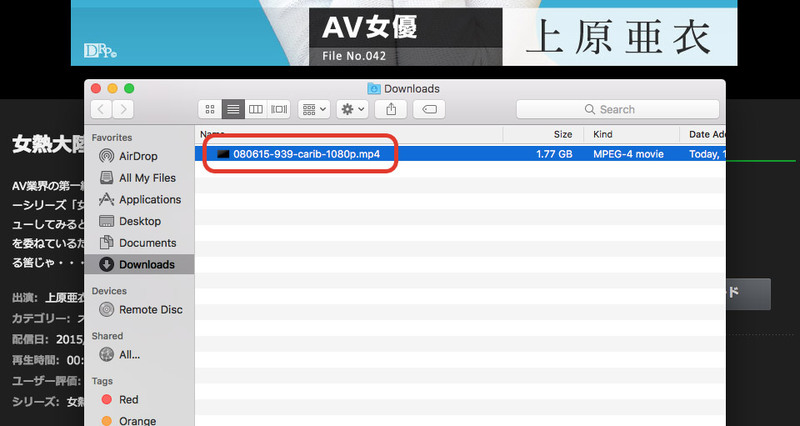 ⑥ Scroll just below the movie player and click on the "ダウンロード" button for the desired file size/format. ⑦ From the dropdown menu, select "save link as". 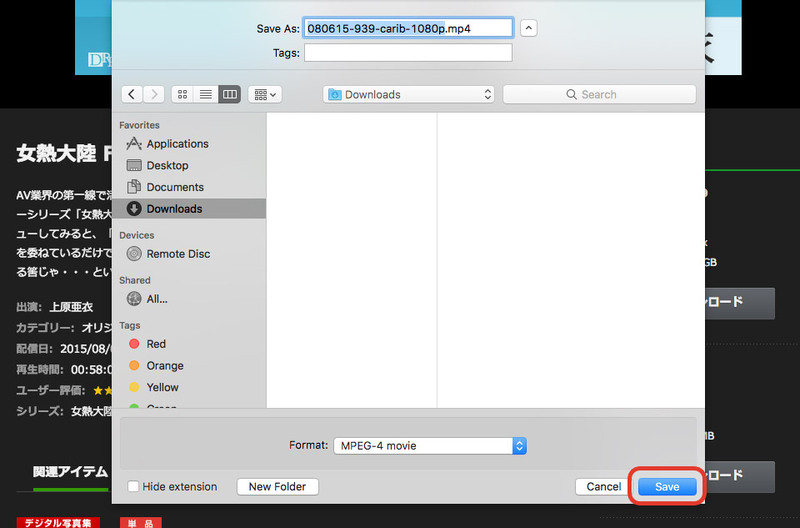 ⑧ Specify where to save the movie file and begin your download. ⑨ Once the movie file is finished downloading, open it with your desired movie player and enjoy! 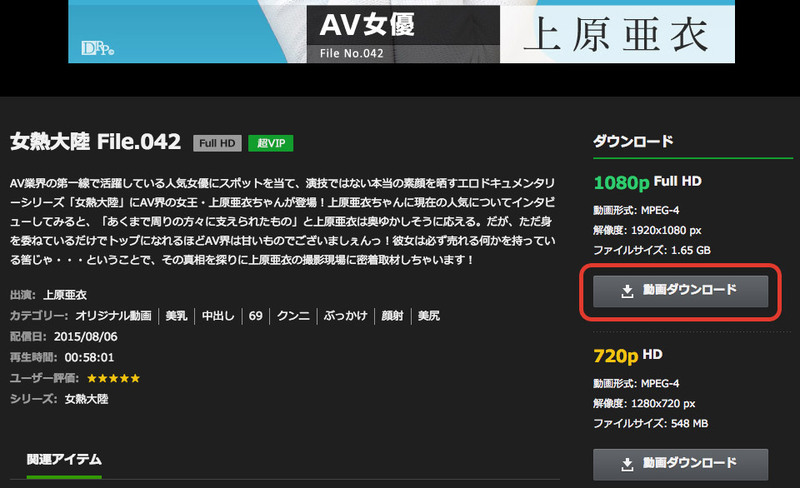 ④ For streaming, use the movie player in the movie detail page. Simply click on the movie player to begin streaming your movie.